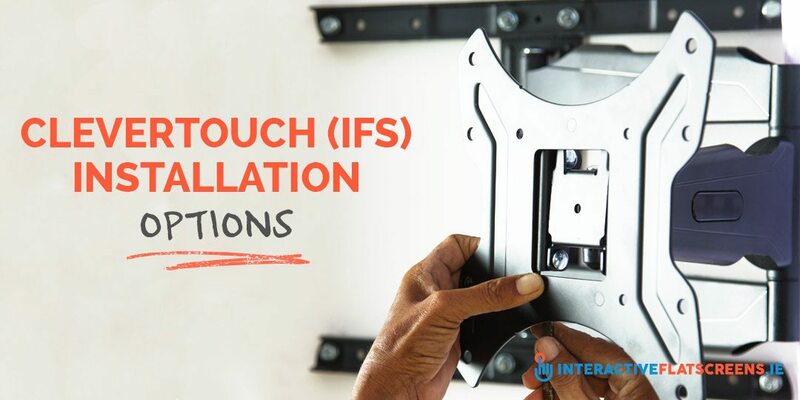 One of the great advantages of interactive flat screen (IFS) display devices is the range of mounting installation options available for them. For every size of screen and possible application out there, there is a mounting option to go with it. Typically in a classroom environment a CLEVERTOUCH display is located in the centre of the wall up front in the classroom. It is very popular to keep a standard dry-wipe whiteboard to either side of the display. Although the CLEVERTOUCH technically replaces the whiteboard we find teachers still like to hold on to a dry-wipe whiteboard located right or left of the IFS maybe for permanently visible notes i.e. days home work, upcoming reminders etc. 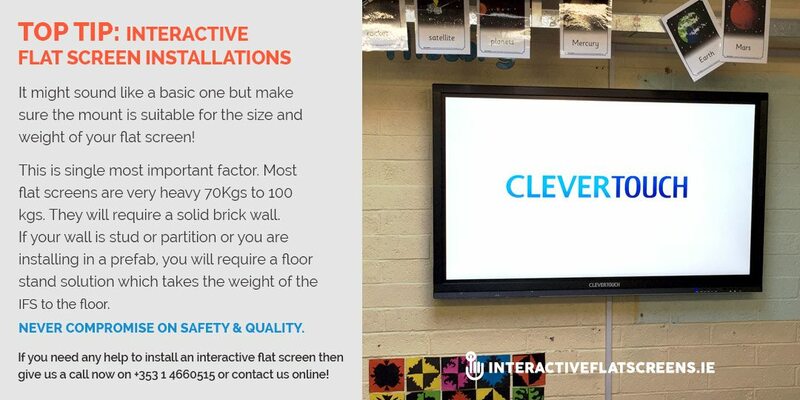 As a CLEVERTOUCH Interactive Flat Screen (IFS) replaces your IWB, projector & speakers, this means that installation can be a lot more flexible as there is no projector placement involved. There is also no dead projection space or shadows when you stand in front of the display which is great. *Requires a solid wall. Not suitable for stud or partition walls without grounds in place. The main consideration when deciding on the mounting of your Interactive Flat Screen is to make sure it is installed by an AV professional. This is not a job for a handyman or caretaker to have a go at. If there is any doubt about the bracket, weight rating or fixing of the bracket DO NOT PROCEED WITH INSTALLATION. We have installed over 2000 Interactive White Board systems throughout Ireland and are installing CLEVERTOUCH IFS’s on a daily basis. We have the expert knowledge required to ensure a clean and most importantly safe install every time. It might sound like a basic one but make sure the mount is suitable for the size and weight of your flat screen! This is single most important factor. Most flat screens are very heavy 70Kgs to 100 kgs (view our interactive flat screen range here). They will require a solid brick wall. If your wall is stud or partition or you are installing in a prefab, you will require a floor stand solution which takes the weight of the IFS to the floor. NEVER COMPROMISE ON SAFETY & QUALITY.